Two congregations of the Church of Jesus Christ of Latter-day Saints are temporarily without a sanctuary as the Glassell Park chapel located in northeast Los Angeles was severely damaged by a brush fire on July 7th, 2015. The most complete news stories are available from KTLA Channel 5 and MyNewsLA; this post summarizes the highlights. It began as a quarter-acre brush fire at the intersection of the Glendale Freeway and North Verdugo Road, first reported at 2:38 P.M. But the fire burned uphill, spreading to the eaves of the chapel located at 3845 Fletcher Drive. 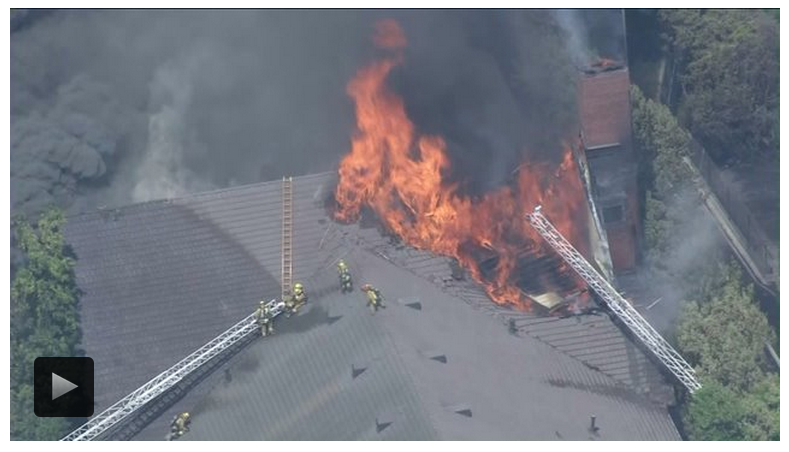 A reported 185 firefighters were eventually involved in suppressing the blaze, and while firefighters initially appeared to have knocked back the flames, the blaze erupted in the building’s attic, sending heavy black smoke over the area. Flames then burned through the roof, a portion of which collapsed and sent firefighters scrambling for ladders to get off the top of the structure. Fire crews then went into a defensive mode, pouring water on the blaze to drown the flames. Some flames spread to nearby palm trees. Two hours and 14 minutes later, the fire was suppressed, and firefighters assisted local church leaders in recovering documents and valuables from insider the chapel. Two firefighters were injured; one's in good condition despite an arm injury and the other in fair condition after complaining of dizziness. The very steep pitched roof with tiles was cited as increasing the difficulty of suppression. The official cause of the brush fire has not been determined. The Eastsider published a timeline of events relating to the fire and has some good photos. Bishop Carlos Diaz of the Fletcher Ward said "It's really sad news. I grew up in here so I know this building really well. It's a real tragedy." James Jenks, a former bishop of the church, said most of the interior damage was confined to the kitchen and some of the classrooms. The chapel area was spared. He also stated that over 1,000 people attended services at the building (KTLA reported 400 people, but the MyNewsLA report seems more realistic). According to maps.lds.org, the resident congregations are the Fletcher Ward and the Arroyo Ward, both part of the Spanish-speaking East Los Angeles California Stake. The congregations will disperse to other nearby chapels to worship for the foreseeable future. Update July 15th: On July 14th, graffiti was discovered on the remains of the Glassell Park chapel. It looks more like gang graffiti rather than any anti-Mormon tagging. Police confirm the graffiti is the work of a known tagging crew. The paint appears to be fresh and may have taken the suspects several nights to complete.